Tickets on sale for Barefoot From Buffalo! 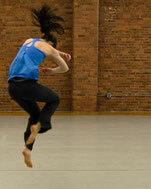 Tickets are on now on sale for the inagural performance season of Ballaro Dance! Join us for Barefoot From Buffalo at The Riverside Theatre on Thursday, June 26 and Friday, June 27. Presenting the work of choreographer, Marisa f. Ballaro, the show features music by The Beatles, Philip Glass, G. Love & Special Sauce, among others. It's an evening of bodies moving in space, that is not to be missed!